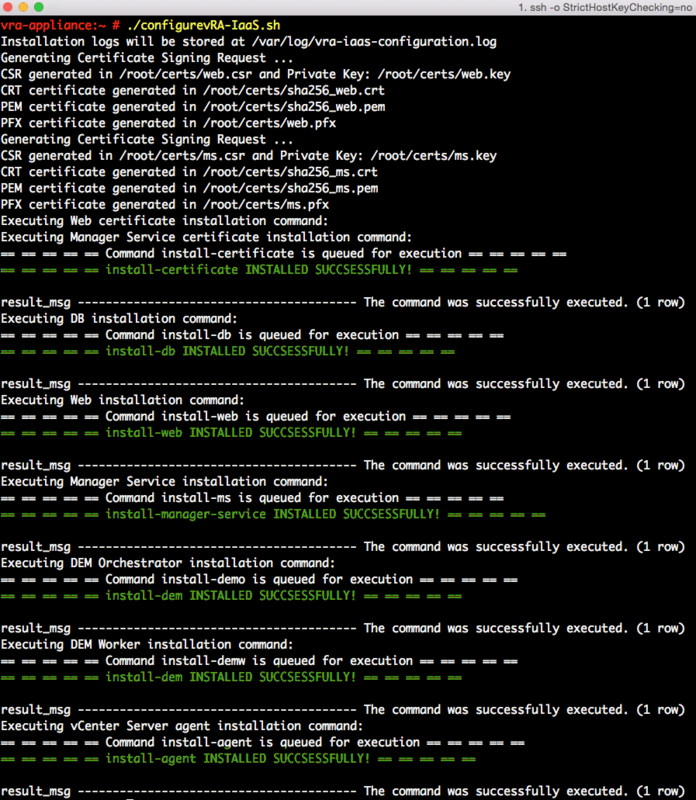 If you have been following the blog series thus far, we have covered deploying the vRA 7 Virtual Appliance, installing the vRA IaaS Management Agent on a Microsoft Windows system which will run the various IaaS components and then finally configuring the vRA Virtual Appliance which includes setting up the VMware Identity Manager (Horizon SSO). Before proceeding to the vRA IaaS installation, you will need to make sure that you have completed all three of steps above. In addition, there are some other prerequisites (more details here) that are required on the Microsoft Windows system in which you plan to install the vRA IaaS components, namely an instance of Microsoft SQL Server running and various Windows configuration tweaks required by the installers. I will not be covering the installation of the DB, so this will be something you will need to either manually install or automate using a silent installer for SQL Server. For the pre-checks, although this is also not covered in the script, I will show you how you can run the same tool on the Windows system like you would using the new vRA 7 Guided Wizard. The tool will identify any configuration issues found and then also allow you to easily remediate them within the tool, which is an awesome feature in my opinion. You will then need to SCP the PrereqChecker.zip file onto your Windows system that you plan to run the vRA IaaS components. Next, extract the contents of the zip and launch the PrereqChecker.exe. Before clicking on the "Run Checker" button, make sure you have enabled the IIS role, else the tool can not run all prechecks. The instructions are located to the right of the screen and once that has been completed, you can then run the precheck tool. For any issues that have been identified, you can remediate by clicking on the "Fix Issue" button. Once all prechecks have passed, you can then move onto the vRA IaaS installation. It turns out there an index.py script which defines which files can be downloaded without authentication. If you wish to change this behavior, you can run the following snippet on the vRA Appliance and then you can download the zip file directly from the browser which can be useful from an automation standpoint. If you have made it to this point, we are now ready to get our automation on! We will be installing the following vRA IaaS components which are listed below onto the Windows system which has the vRA IaaS Management Agent running. The automation will be completely driven from within the vRA Virtual Appliance using the configurevRA-IaaS.sh shell script. This is possible because we had deployed the vRA IaaS Management Agent earlier which will act as a proxy for all component installations. There are 9 variables that you will need to edit prior to running the script and you can find their descriptions below. 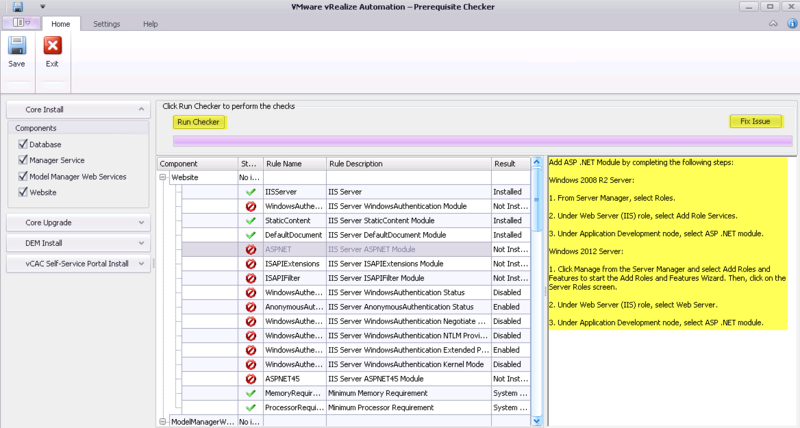 Once you have saved your changes, you can then run the script on the vRA Appliance as shown in the screenshot below. All verbose output is stored in /var/log/vra-iaas-configuration.log and you will be able to see the high level operations displayed in the console. The entire process can take anywhere from 10-20 minutes depending on your environment and what you will looking for are the "INSTALLED SUCCESSFULLY" messages which I have highlighted in green below. If you have met all prereqs, you should not run into any issues but if you do, the script will output the specific errors from each of the installers. Once the script has completed, you will now have a fully functional vRA 7 deployment which includes both the vRA Appliance as well as the vRA IaaS components! I would also like to give a big thanks to both Kim Delgado for connecting me with some of the vRA Engineering folks as well as a huge thanks to Dora L. from the vRA Engineering for assisting me with parts of the IaaS installation. However, I am facing an error while executing this scipt.. Generate Certificate Signing Request failed. Basically the variables were not being picked up in the right order in the web.cfg file. BTW William, thanks for the work, brilliant as always. Will this script work if my database is on another machine (different from IaaS)? System.Data.Services.Client.DataServiceTransportException: The underlying connection was closed: Could not establish trust relationship for the SSL/TLS secure channel. —> System.Net.WebException: The underlying connection was closed: Could not establish trust relationship for the SSL/TLS secure channel. —> System.Security.Authentication.AuthenticationException: The remote certificate is invalid according to the validation procedure. I am facing the same issue! I’m facing the same issue trying to install vRA 6.2.4. Has their been any resolution? :Could not establish trust relationship for the SSL/TLS secure channel. —> System.Net.WebException: The underlying connection was closed: Could not establish trust relationship for the SSL/TLS secure channel. —> System.Security.Authentication.AuthenticationException: The remote certificate is invalid according to the validation procedure. Could not establish trust relationship for the SSL/TLS secure channel. —> System.Net.WebException: The underlying connection was closed: Could not establish trust relationship for the SSL/TLS secure channel. —> System.Security.Authentication.AuthenticationException: The remote certificate is invalid according to the validation procedure. We are using external database for vRA7 setup. Let us know if you/your team get some solution. I’m experiencing the same SSL/TLS error with vRA 6.2.4. Same scenario.